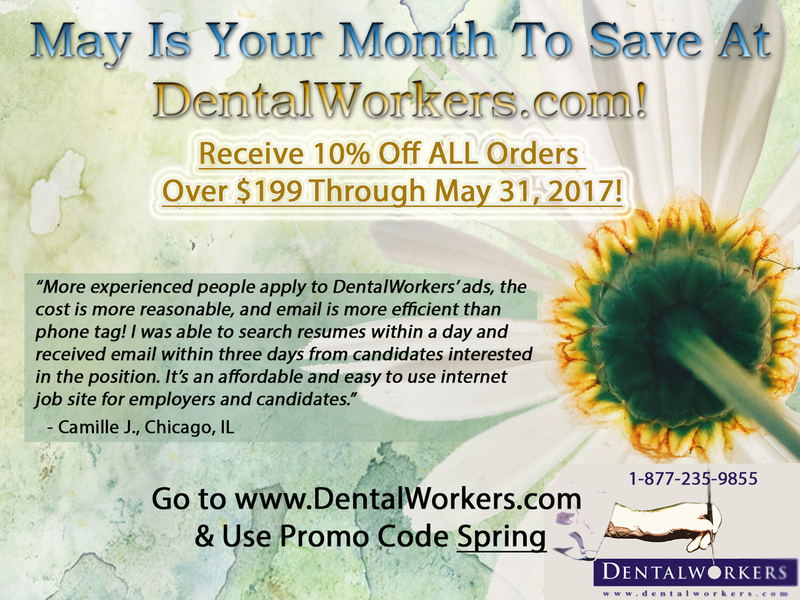 Save 10% On All Orders Over $199 For The Entire Month Of May At DentalWorkers.com! Have Questions About Your DentalWorkers' Savings Opportunities? It’s now May, which means that thousands of dental students will be graduating all over the country and will be looking for dental jobs. As a niche job board, specifically for the dental industry, DentalWorkers.com wants to make it easier for you to find only the best graduates and top talent. We therefore have a special which coincides with this new crop of dental graduates, going on for the WHOLE month of May! Receive 10% off ALL of your orders over $199 through DentalWorkers.com! Customize a Dental job ad package that is right for you, your job opening, and the person you are looking to fill your position. • Unlimited words in your job ad – we can even help you craft it to your specifications! • Access to Dental resumes in your entire job title group of candidates that match your job ad package! • We email your job ad to your matched candidate group, and as Dental resumes come in, we send them right to you! • Your job ad will be mirrored and posted on additional job and networking sites! You don’t just save on Job Ad Packages in May – you also save 10% on Text and Banner Ads, when orders over $199 are purchased! Get your message out and have it be seen by thousands of Dental Assistants, Dental Hygienists, Dentists and many more dental professionals, when we post it on our site! Don’t forget to enter promo code Spring when you check out! Visit DentalWorkers.com, to take advantage of this amazing savings’ opportunity!